What? Wednesday Weave...where's the Wednesday Word?? Not to worry, it's still around. Today it's at the bottom of the blog, but it'll eventually be front and center. I wanted to shake things up a bit on Wednesday's. "Mooouum" Yeah, can hear the exasperation in that voice. I swear all kids are born with that tone, I know I had it as a youngling, but for me it was always, "Mo-ther"
Anyway, come to find out all we needed for a workable loom was some different sized cardboard pieces...well that I have! What I didn't have much of is yarn. I had a standard Red, Black and White from a Christmas project we did together a couple of years ago, but that was it. Darling Diva made it work though and cracked out a lovely red and white piece to show me how to do it. From there I was intrigued. I've always loved to do crafts and large scale weaving was so enticing, but who has the room or money for a larger loom. 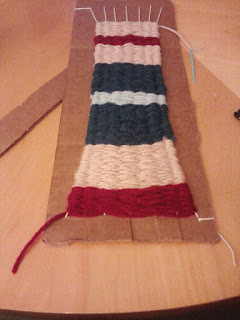 Knitting is killer on my wrists and I have yet to pick up on how to crochet, but weaving like this...it felt right. So I'm attempting a scarf with the treasure my sister-in-law(whose been more a sister to me from the moment we first met-I got really lucky with my hubby's family) gave us. Darling Diva taught her the new skill as well and was overjoyed with the mother load of yarn her aunt wanted to share with her. 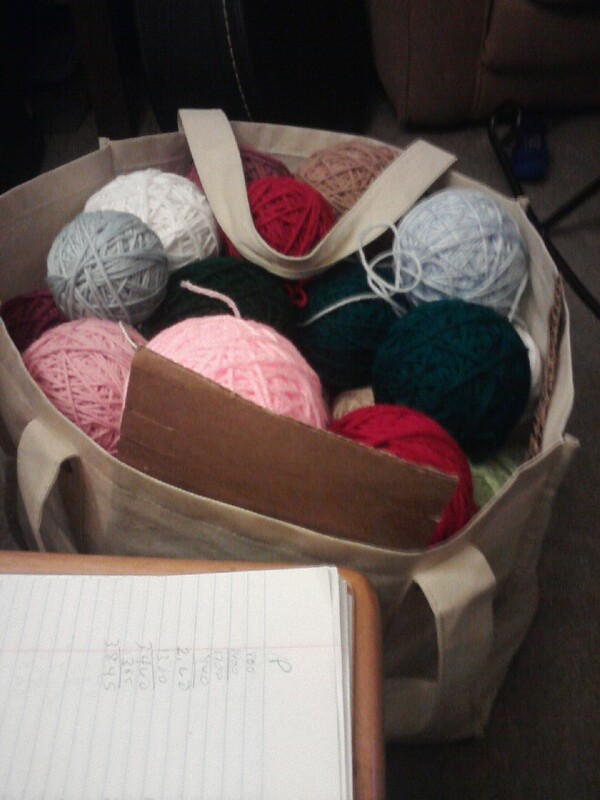 Yep, that bag is packed full of balls of delight. I'll be keeping ya'll updated on my progress on the scarf. If anyone has any weaving tips, drop me a note...I'd love to hear them. Quote of the Day: Poetry is eternal graffiti written in the heart of everyone. In honor of World Poetry Day. Word of the Day: Limerick - a kind of a witty, humorous, or nonsense poem, especially one in five-line anapestic or amphibrachic meter with a strict rhyme scheme (AABBA), which is sometimes obscene with humorous intent. Ultra cool about the weaving. I've never tried it. I have watched demos at the Renn Faire because I was fascinated. Especially the family and ladies who had their own sheep and used their wool to spin the yarn. Oh, wait, I take that back. As a kiddo I did do a sort of weaving with seed beads, and loved it. I kind of made up how to do it. I would love to have taken a weaving class that was American Indian and/or Medieval/Renaissance. Yeah, I kept looking at pictures of the seed bead jewelry and learned how to imitate it. I wish I had some time now to create some pieces.